So with it being the new year most would expect me to turn round and say ditch your clothes from last year, it's a new year so, new you right? Wrong! Don't go ditching your Christmas jumpers and snoods quite yet, the snow is here and it's not going to be warm enough for your favourite pair of Bambi and Manson's just yet (despite what Kylie and Kendal Jenner may have you believe!). My fashion essential for this month is the Boot! Whether its knee high, ankle or Chelsea, all are perfect for Britains everlasting Winter. Firstly the knee high. Now with a boot like this don't bother scrimping and saving, you want boots like these to last a lifetime, so I suggest going for a good leather. Topshop have an awesome range at the moment ranging from around £80/£90 . I've had a pair for about 2 months now and I've worn them day after day and they are still looking HOT! With the knee high don't just go for a plain style either, I find what's really cool is having something going down the back of the leg, either a line of studs or have the zip down the back. This draws the attention down the centre of the leg and has an amazing slimming affect (and who doesn't want that?). Secondly the ankle or calf boot. Now these are for those girls who love a good boot but want something a little more understated and casual. This is also a boot that has the flexibility to be worn most seasons. For these I suggest again go for a good leather boot for durability. But for these go all out on the studs and buckles, you want people to hear you before they see you as you walk down the street. Unlike the knee high boot be free to get a little height in there and go for a small heel for nights on the town, but if you just want something for everyday use stick to flats! 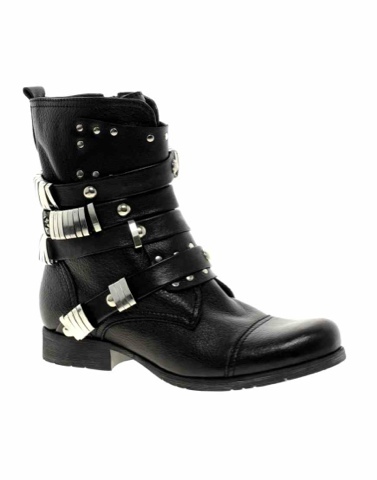 The key with this look is to keep the studs and buckles in the heel area, too much and you'll look like a Cowboy! The brand Bertie are doing this fantastically this month! Prices are around £100 at Bertie so if you want something affordable New Look can get you something similar for about £30. Thirdly the Chelsea Boot! Now these have been rocketing off the shelves over the past few months so are a great buy! So for nights on the town for this snowy weather you should be hiding away your ballet pumps and six inch Jeffrey Cambells and swapping them for the more safety conscious Chelsea Boots. But are they dressy enough for a night out?!? Of course they are!! Whether it be studded heels or covered in glitter they will bring some understated chic to you outfit (without the safety risk). Try Urban Outfitters for some gorgeous styles at around £40, and as they are from last season many styles you may be able to find in the sale!! So hurry before the winter bites you back!! !